Tours are offered daily by appointment only at 10:30am, 11:45am, 1:00pm, and 2:30pm. Located in the Hennessey Basin on the eastern rim of the Napa Valley, the 761 acres of predominantly undeveloped wilderness property that makes up Kuleto Estate offers a remarkable number of unique growing environments and microclimates. This coupled with three distinctive soil types and an expansive range of plantable elevations makes Kuleto Estate not merely suitable for, but exceptionally appropriate to an astonishing number of varietals. A modest 90 acres have been planted, with no plans to grow beyond 123 cultivated acres. Of the planted acres, Cabernet Sauvignon represents the largest block, followed by Syrah, Zinfandel, Sangiovese, Pinot Noir, Chardonnay, Cabernet Franc, Petit Verdot, Malbec and Muscat. Tended by a dedicated full-time vineyard and winery team of fifteen people with a total production of around 10,000 cases, much of the work both in the vineyard and the winery is lovingly done by hand. With fruit pressed from beautifully maturing vines, the wines of Kuleto Estate reflect the generous character of their terroir. Very warm and elegant. Casual and informative wine presentation indoors or on winery terrace covered with grapevines. Walking tour to look out over Napa Valley. One of the best views in the world! 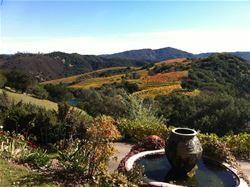 To join the wine club, visit www.kuletoestate.com or call 707-302-2209. We offer two membership tiers. Our wine club benefits include: complimentary tour & tasting for a total of four in your party, 20% savings on your club offerings and retail purchases, and 25% off on-reorders of your club shipments within 30-days of the shipments. Other benefits include our exclusive membership newsletter. For more information, please contact us at wineclub@kuletoestate.com.